When you are decorating your house or decorating for a party do you always know exactly what you are looking for? I find that I sometimes do, thanks to the inspirations of pinterest, but often I just have an idea of the general “look” I am trying to achieve and then I hunt for pieces that I think fit into that look. I was recently chatting with a friend of mine who is re-decorating her main living area. She was showing me a beautiful blue-ish pillow she had found that was the inspiration for the accent colour she planned to use in the space. She was talking about her frustrations in trying to find other items like frames, mirrors, clocks, etc that would match the blue in the pillow. The uniqueness of the shade of blue in the pillow made it stunning, but it also made it very difficult to match. She said to me, “You always seems to find the perfect things to match in your house. Where do you find everything?” My reply to her was to let her in to one of my favourite tips/tricks! The truth is I don’t always find things to match my decor! I PAINT EVERYTHING! I never shop based on colour! I always look at the shape and overall “look” of an item and if I love it, regardless of it’s colour, I buy it! This comes in especially handy for me because I love to shop thrift stores, flea markets and garage sales! If you spot a beautiful second hand piece, there are not going to be colour options. Have you ever been shopping and spotted something you love and thought “Oh I wish that came in such and such colour?” If you can master your spray painting skills, (which is actually quite easy) you can make anything look great in the colour of your choice! Here are some examples of items I have loved, but weren’t in the colour I loved! I should use the word “colour” lightly…I almost always paint things white! Is white a colour?! 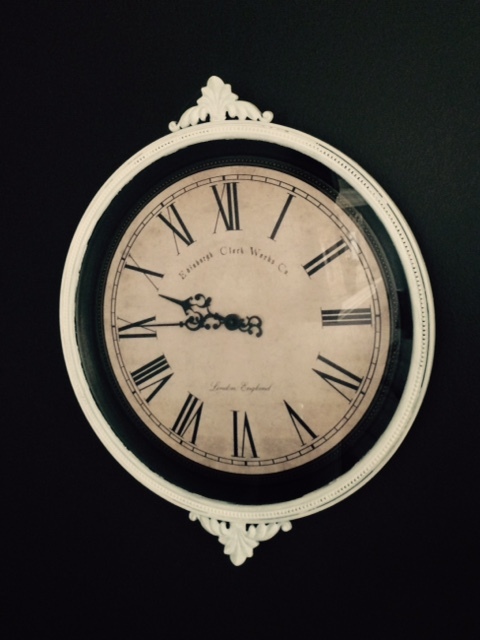 This clock was brown when I found it at Homesense. 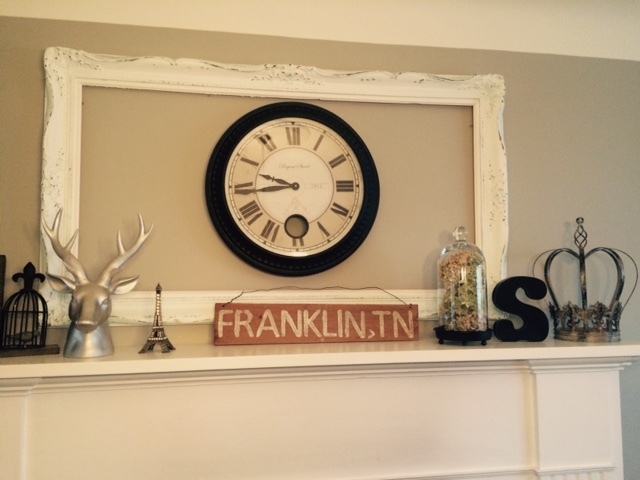 I loved the look of the clock but really needed white to match my decor. I taped off the face of the clock and spray painted it! 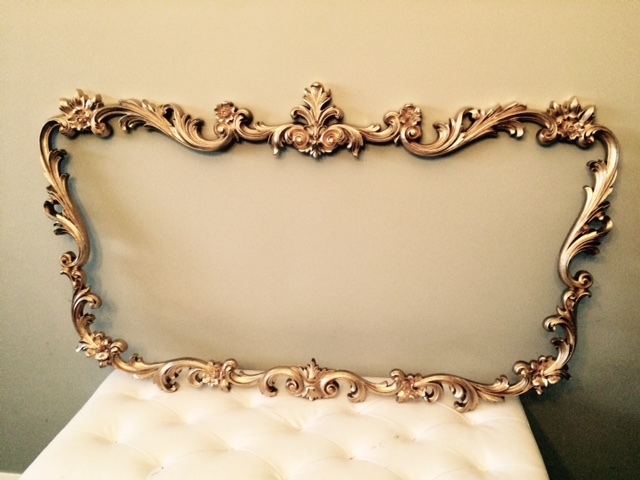 I found this gorgeous frame at a garage sale! It was originally a mirror but the glass inside was shattered. The frame was originally a forest green, but as you can see I sprayed it gold. I am using this piece as part of the decor for my daughters gold and blue themed birthday party. After the party is finished I plan to spray it white and add a chalkboard in the middle. This frame cost me $5! This is another piece that will be used for my daughters birthday! 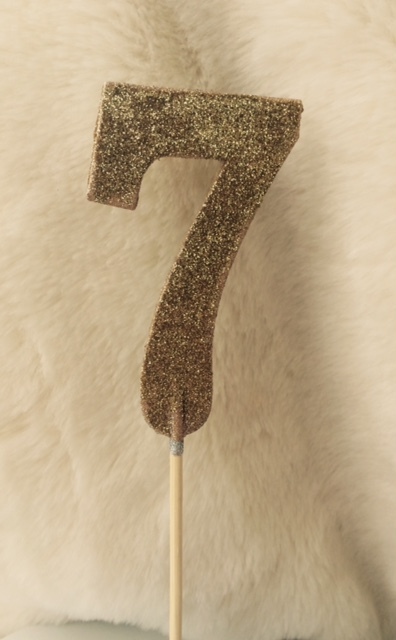 My daughter LOVES glitter so when I saw this cute cake topper at Hobby Lobby for $1.99, I had to get it! As I mentioned before the colour theme for my daughters party is gold and blue. This seven was originally sparkly silver. Once again, I painted it and added gold glitter and it turned out great! This is another garage sale find! This white frame was originally gold and had a very dated print in it. I sprayed it white and then lightly sanded it. I love the way it turned out! This frame cost $15. When it was time for my son to move into a “big boy bed” we transformed his room into a beach theme. The main accent colour in the room is a dark navy blue. I loved this little sign but the outer frame was a peachy colour so I just taped off the inside and spray the outer edge blue! 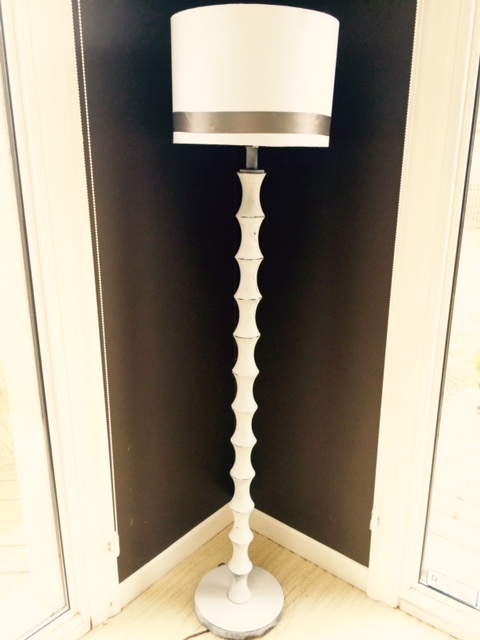 A few years ago I was looking everywhere for a tall lamp like this in white. The only ones I found were completely unaffordable! I found this lamp (originally black) at Target for super cheap so I scooped it up and sprayed it white! I found this mirror at a thrift shop for $7. It was originally gold and really dusty. I took it home, gave it a good scrub and painted it white! This is one of my favourite pieces in my house! It is so unique! This shelf had a lot of alterations! 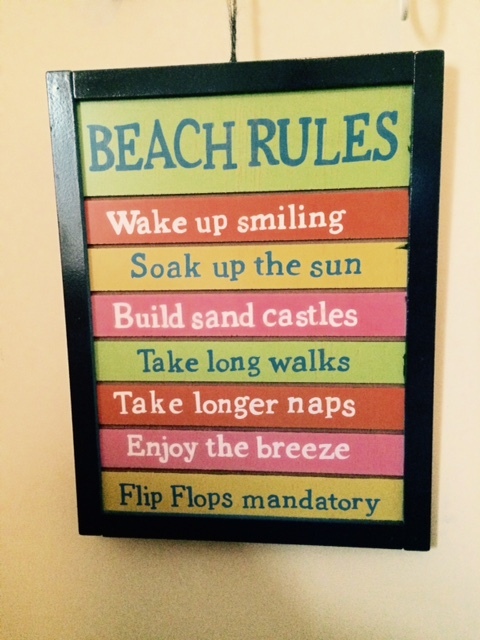 When I was decorating for my son’s beach theme room, I was looking for a shelf for a small wall area in his room. After searching high and low and not finding anything that was quite right, I ended up making this shelf. This shelf was originally a dark wood stain. 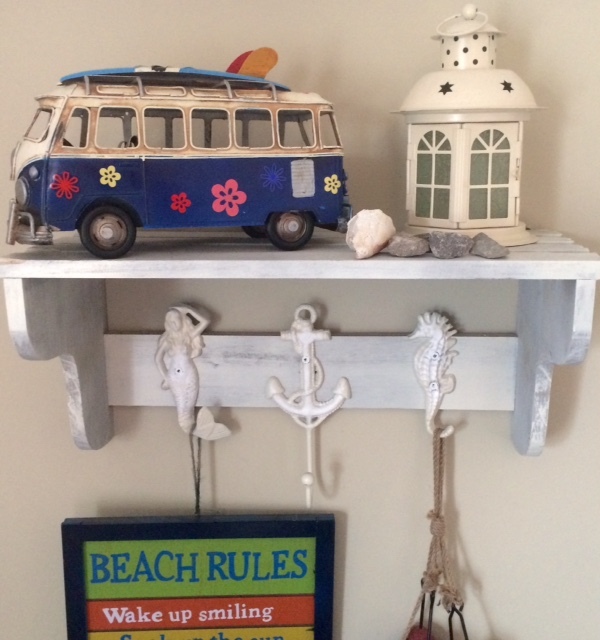 I painted the shelf with a white wash paint to make it look “beach-y.” Then, I found these cute nautical looking hooks. The hooks were metal and had a gold rusted metal look to them. I painted the hooks and had them screwed into the shelf. I love the way this turned out! It’s so cute! 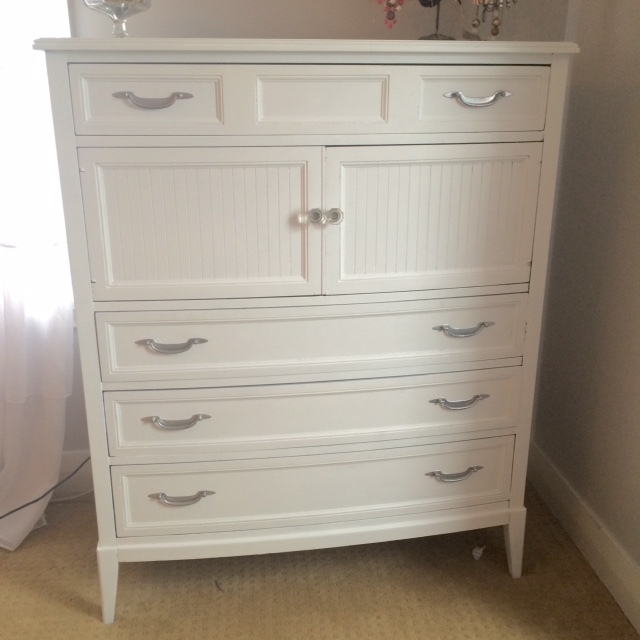 I found this dresser on Kijiji. I LOVED the shape of this dresser. It was painted jet black with a really bad paint job so it was being sold for $40! When I asked my husband to pick it up for me, he thought I was crazy! “What do you want to do with THAT? !” he asked. 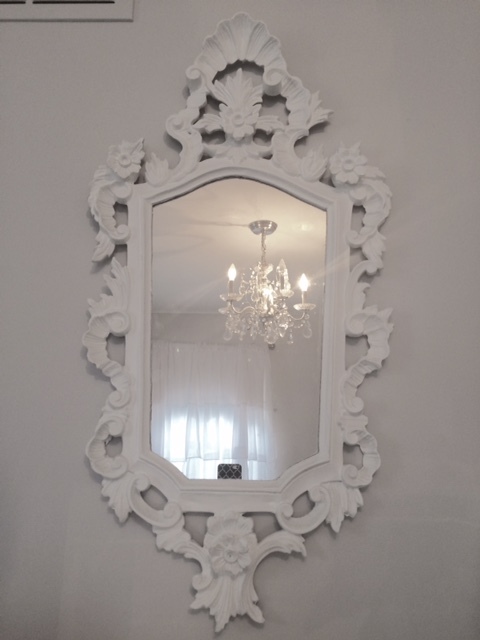 I was pretty confident that it could be transformed with a few coats of chalk paint and some new hardware! Plus, it was such an awesome deal I just couldn’t pass it up! The end result speaks for itself! Share your own painting DIY in the comments! I would love to see them!